I hope you all had fabulous weekend. Mine was lots of fun just spending time with the family. We even had a snow day in San Antonio on Friday. Now, that's something I never thought would happen! The best part was that my hubby got into a shopping mood, so we all went shopping and got the k ids new clothes! Yay! I always feel better when they have everything they need. I don't know, must be a mom thing! So, I have a very simple card to share today. When I was looking through the challenge list to see which ones it would fit, I discovered that it went with A LOT of them. Obviously, Valentine's Day cards are hot topics in challenges at the moment! This card was fun to put together, I had not done the foiled embossing technique for a while and I liked the way it turned out. If you haven't stopped by in a couple of days, be sure to read about my new contest Delightful Daisies" so you can be eligible for your chance to win the $15 gift certificate to Two Peas at the end of this month! Trust me, this is the easiest contest you'll ever enter!! Ok, so here is the monster list of challenges that this card fits. Boy, I am going to have a ton of great cards to go look at! Thank you for joining us at Little Claire and best of luck for the monthly challenge. Oh too cute, love this! Thanks for playing with us at Our Craft Lounge. 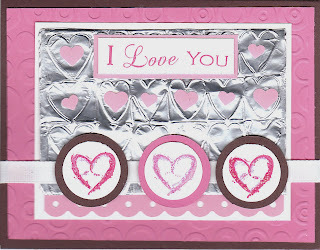 I love your foil embossing, its very effective and looks great! Thanks for joining us over at Crafty Calender this month! Fabulous! Love the tin foil embossing! Thanks for playing RESQ challenge this week! Great card! I love the embossed foil! That's really pretty - love the effect created by the foil. Thanks for joining us at the first Little Claire Designs Monthly Challenge. thats lovely embossing. Never tried it before. pink and silver is going very well. The embossed foil is a lovely touch. Thanks for playing along at Phindy's Place this week. Very pretty. I love the colors you used. Thanks for playing with us at Stamping With The Dragon. WOW ~ Challenge Queen here! Great card and thanks so much for playing along on the OCL Color Challenge this week! How cute, love the metal look! Thanks for playing in the OCL Challenge! !